Transculturalvisions is proud to present Phase 2 of our Singing Cultures Journey, Harmonies from Classical Melodies, inspired by the rich heritage of African classical music, featuring the Singing Cultures Choir accompanied by dynamic pianist Kevin Satizabal, acclaimed soprano Victoria Oruwari, and renowned flautist Rowland Sutherland. Thank you to everyone who came out to our last concert! 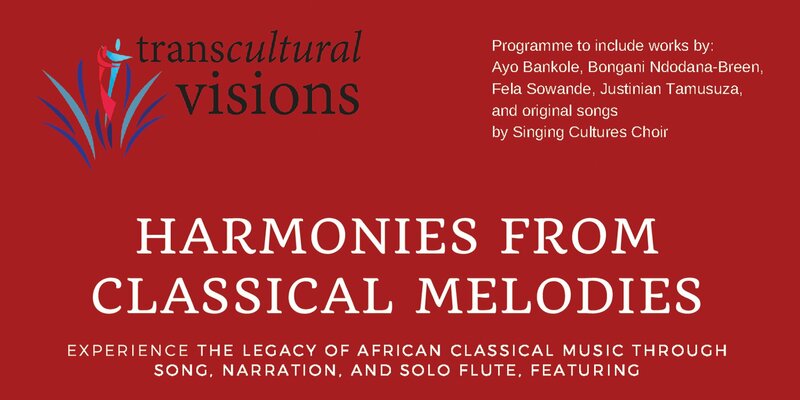 Inspired by the music of African composers Harmonies from Classical Melodies will feature the Singing Cultures Choir performing notable works from the canon, African folksongs and new works created by the choristers, led by British-Nigerian soprano and choral conductor, Victoria Oruwari. There will be a narrative performance capturing the journey of the choir. The programme also features celebrated flautist Rowland Sutherland performing solo flute pieces by contemporary African composers Justinian Tamusuza (Tanzania) and Bongani Ndodana-Breen (South Africa).